Is the next Nexus going to be made by LG? Today Modaco founder, Paul O'Brien took to Twitter to announce some details from his, trusted sources, about an upcoming Nexus device from LG! Although, he made it explicitly clear that he doesn't know if this is the only Nexus device which will be arriving! Alcatel announces a new budget tablet. Alcatel, a company well known for it's One Touch line of mobile phones. They're devices which offer low-mid end specs at extremely low price points. The company has recently been working on plans to offer a tablet based on the same principles. The work has culminated in the announcement of the One Touch T10, a new 7″ tablet. The specs follow Alcatel's normal routine and are relatively unspectacular. 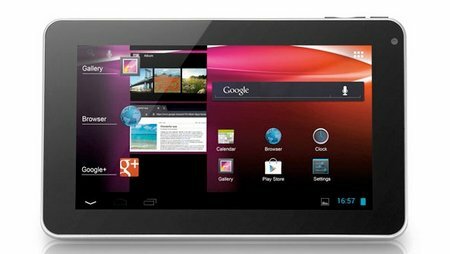 The device has it's 7" 800×480p screen powered by a 1GHz single-core Rockchip processor, Android 4.0.3, alongside 1GB of RAM. There's 4GB of built in storage, as well as Micro SD support, and a front-facing 0.3MP camera for those Skype calls! What price will this tech set you back; if you live in Europe it'll be about 120 Euros, so around abouts £100 in the UK. Might we suggest the Nexus 7 as an alternative if you can stump up the extra £60! Sony are recalling their Xperia Tablet S' after a revelation that some units are not 'splashproof' because of a gap between the screen and the main body of the tablet was caused in the manufacturing process. The full details are here! Asus' upcoming PadFone 2 is shaping up to be a powerhouse! The Chinese manufacturer, Huawei, has announced plans for an IPO. This is a great way for Huawei to raise some extra capital, become more open and transparent, something which will particularly helpful for a company who is still fighting to gain mind share in Western markets. Although this is in the very early stages still so it'll be some time yet before anything happens! Via PhoneArena. Pokemon Black Version 2 and Pokemon White Version 2 will be launching on October 7th. Pantech has announced Android 4.0 updates for their Burst and Element smartphones! Samsung beat out the company's previous a record quarter by posting profits of $7.3bn for Q3! And finally, Rovio has teased a sequel to Angry Birds... All they offered was this picture, hmm star wars themed Angry Birds? This is from the company's new Tumblr page, which tells you to head to Times Square in New York City on October 8 at 10am EST, and also to head to a Toys R Us at 8am EST so it'll be something do with toys! Yay!